How does AT&T still exist? Once a monopoly (Ma Bell), the mindset behind the company is still that of a monopoly. Customer service is non-existent if not antagonistic towards its customers. Just daring to call AT&T to initiate service and you’ll first spend five to ten minutes pressing (1, 2, 1, 3, 1, Ho, Haha, 2, Guard, Turn, 1, Parry, 1, Dodge, Spin, 3, Ha, Thrust)… before you’re put on hold for a half an hour (at best) and listen to the same annoying message a hundred times before someone finally answers. In help desk circles, this is known as the Kevorkian Maneuver, where they annoy the crap out of you in an attempt to get you to simply disconnect yourself. The Idiot AT&T Employee (most likely) is an incompetent idiot who has the one necessary skill of being able to read a response from a computer. If the computer says “Mama wanna dog face to the banana patch.” That’s what you’re going to get. Deviation from that script or any attempt at rational thought isn’t going to happen. They aren’t there to help you. They are there as a barrier between you and anyone who could and/or management. Then there’s the Pissed-Off AT&T Employee (I call them Careerers). This is the person who hates you more than anyone else on Earth. I believe they blame you for the living hell that is their existence. They may even be lost souls in hell, taking instruction from Satan to torment the living. Just a theory… I’m not sure. Anyway, given the choice to easily fix your problem or go out of their way and not, you’re screwed. I have to deal with this company on a similar regular basis. Having to do so it the bane of my existance. But I’m not alone. EVERY, and I mean EVERY person (especially IT) I’ve ever talked to has the same opinion of them. I’m 46 years old, and moderately healthy. If ever there is true competition in the telecommunications market; AT&T is finished. I only pray that I’m still around to see that day. I’ll throw a party or at least buy a round of drinks. I am deeply saddened that AT&T is buying T-Mobile, which has excellent customer service and an excellent network. It cannot bode well for my beloved cell phone provider. 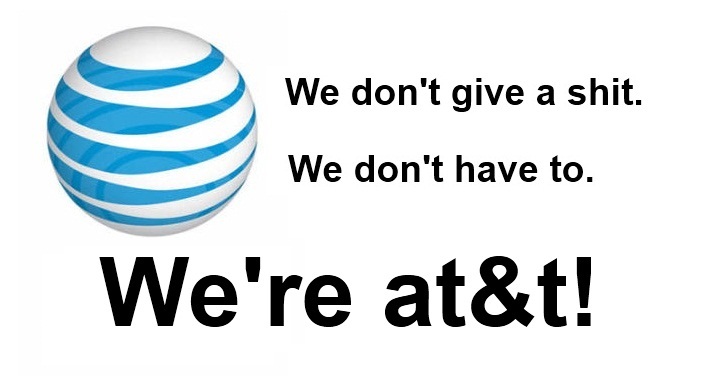 But as to your anti-AT&T comments, allow me to add this: I worked for AT&T as a contractor for several months. I did *nothing. * I don’t mean, the work was easy or slow paced. I mean, *nothing. * I got bored of blogging, cleaning my car, finding local bookstores, discussing philosophy with an Indian co-not-worker, and going for long walks around the building. Eventually I stopped doing it 8-5, and did it… oh, 10 to 2:30 or so. After about six weeks of that, my boss called my cell phone as I was driving home, and asked where I was. I told her. (This was a person I had literally not seen or heard from for two months.) She asked me to come back to the office, so I did. There was nothing to do; she just didn’t like seeing the chair empty. Finally, after another month, the project was canceled. What was the project supposed to be? Developing training for managers, so they could replace the workers who were probably going to strike when their latest contract expired. “I was the first contractor hired on that project in 2008. I have never worked with such an uncaring, incompetent, wasteful collection of mouth-breathers as I met at AT&T in my entire 20+ year career. I am amazed they do not stumble off the third-floor railing like lemmings, perpetually crushing themselves into abstract sculpture. Their employee training department in Irving TX is the laughing stock of the local industry. The only people who work and stay there are people who could not get better jobs, or whose butts have fused into the furniture. Now, that said, the Cingular guys seemed to be pretty sharp — but that only happened when they spun off from AT&T… then were reabsorbed… then sucked, again. Sigh. Dammit, bringing up AT&T brings out the Johnson in me. I need to wash down this bile with some orange juice and a Snickers bar. What set me off was we lost out internet access today and it was off and on all day. I immediately checked our equipment and verified that we were not receiving a signal through our T1 line. It was then my responsibility to call AT&T and “open a trouble ticket”. Yes, This is (name here) with (company name here), my call back number is 936-555-1212 x32. Our location is in East Texas which makes us Central Time, our office hours are Monday through Friday 8am to 5pm. I have access to the router in question and I can verify that it has power. My account number is (###), my Site ID is (###), my circuit ID is (###), my Serial IP is (###). At this point, I’ve spent a brain numbing hour with these people and we’ve just now reached the point where I can tell them that they have turned off our internet service. When I worked for a small company that got bought by Siemens, and the training dept was part of customer care (because it was mostly tech training on products), they would change the phone tree every week, because pissed off customers kept posting the direct-path numbers on the internet (such as, “press 1, 1, 3, 1, 5, 7, ignore message and wait to get to a real person”) — and talking to real people is expensive. Siemens didn’t want that.